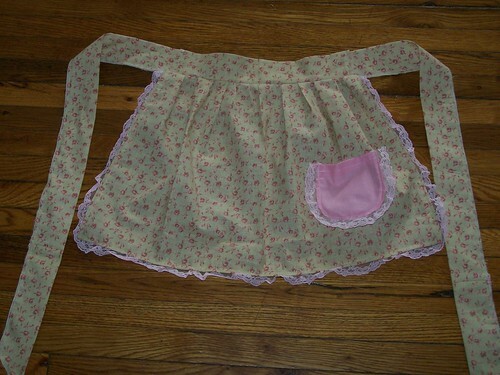 This is my first little girl apron.� I made this one for my granddaughter, Alexius.� I am sure there are many things I did wrong as I am just learning how to read patterns.� Most of the time, I did not know what the pattern was telling me to do so I just figured it out my way and did it.� I used some old material I had,��just in case I messed up.� I thought it would be better to practice some with the new machine. 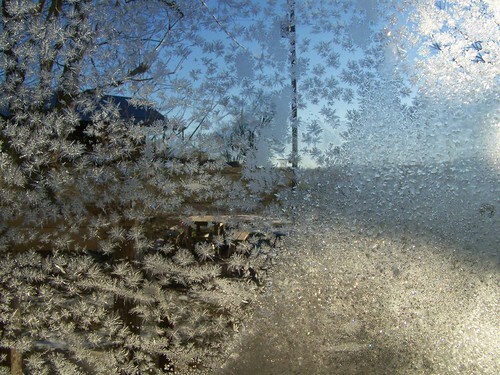 Temperatures are very cold here again.� Wind chill this morning was -10 degrees.� The wind has been whipping all day, gusts up in the 50 mph range.� Our snow is now blown into 2-3 ft drifts.� The predictions are, though,��for it to warm up by the weekend.� I certainly hope so. 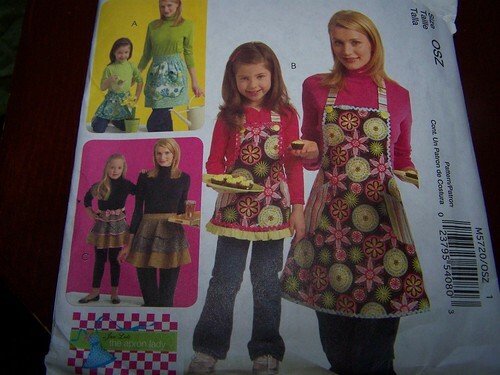 I think I will go work on another apron pattern.� This time, I think I will try the pattern I am wanting to make to sell.� I need to practice on it some and besides I can always enjoy a new apron.� Take care and God bless. 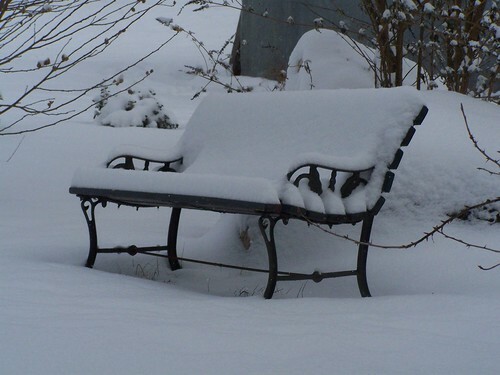 Well, the snow did come yesterday-about 4″.� So no family coming today.� Hopefully, Dave, Jess and the boys will get to come about the middle of the week.� I’m not sure when Chuck will come.� The girls are excited today.� There is enough snow to make snow cream, which is a favorite around here.� There probably will be some sledding today too.� The winds are supposed to start later today so we’ll just have to see how everything goes.� The cows don’t seem to mind the snow at all. 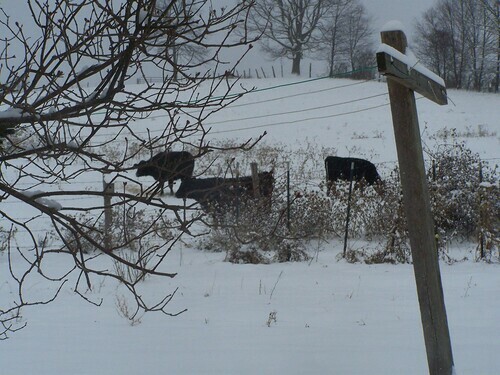 I took these pictures from our dining room window.� Later today, we will be going down to the barn to get milk.� I will try to take more pictures then. 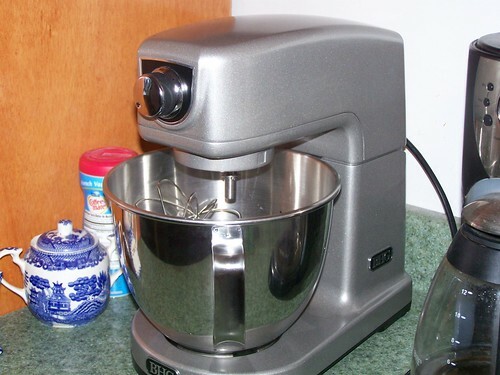 1 1/2 cups all purpose flour (I used whole wheat), 2/3 cup sugar, 1 tsp baking powder, 1/2 tsp. baking soda, 1/2 tsp. salt, 1/3 cup applesauce, 2 eggs, 1/4 cup sour cream, 1 tsp. vanilla, 1/2 tsp cinnamon, 1/4 tsp. 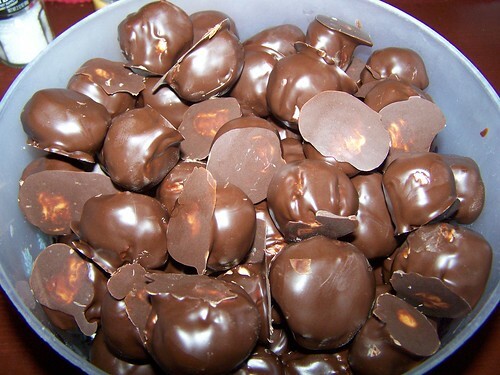 allspice,�2/3 cup mashed bananas, 1/3 cup chopped walnuts.� Combine all ingredients.�� Pour into muffin tin. �Bake at 400 degrees for 20-25 min.� I used my large muffin tin and got 6 muffins.� Very good. No church today because of the snow.� I sure am glad we got to go Friday night to the candlelight service.� Enjoy your day and God bless. 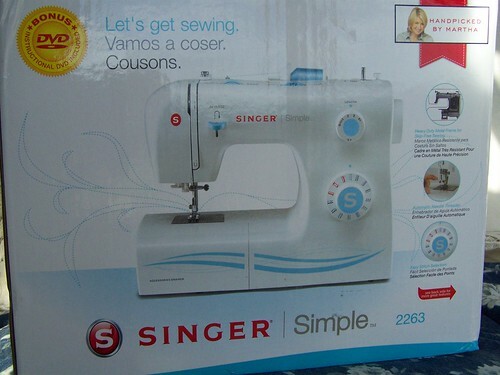 Yesterday, I decided I just could not fix my machine.� We decided we should not be having all that trouble with a new machine so we took the machine back to Wal-Mart where we had purchased it.� As you all recall, I had not had the machine very long at all and it has always given me trouble.� Anyway, Wal-Mart took it back and we exchanged it for this machine.� As soon as I started sewing on it, it was obvious this is a better machine.� I have never used a Singer before but I definitely pray we will be getting better service from this one than from the Brother.� I finished the sewing project that I had previously started. 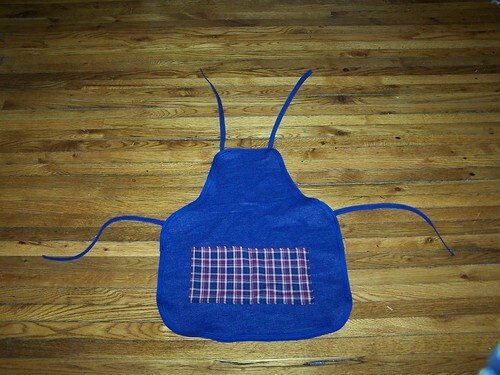 This is for my little man, Daniel, who loves, loves, loves to help his mom in the kitchen.� I hope it looks like a little boy apron.� I wanted something with tractors on it but blue jean material was all I had that looked boyish.� Weather permitted they will be coming up Sunday.� Chuck and his family may come also.� This would be a first-all my grandkids in the house at the same time.� WOW!� They are calling for some snow to hit here tomorrow and Sunday so we’ll just have to wait and see. Celebrate the birth of our Savior.� May He bless each of you with a special portion of His presence on this wonderful day-Christ’s birthday.�� God bless. 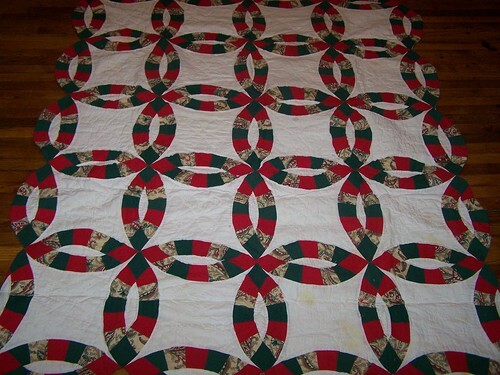 I love to use this quilt every year as my tablecloth at Christmas.� I did not make the quilt and to be honest I have had it so long I don’t really remember who did.� I love it though.� It looks so pretty on our table.� I took the picture of it on the floor because I wanted you all to really see it good.� I think if quilts could talk, this one would say cheerful, happy things. 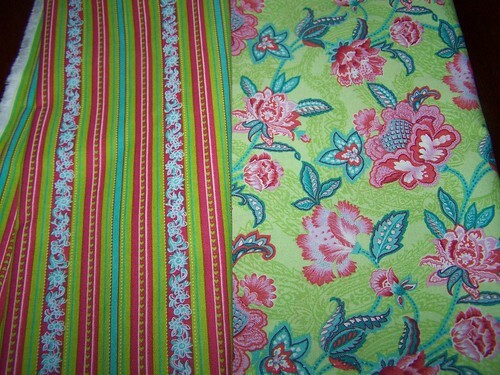 Monday, I did some grocery shopping for our Christmas meal.� We visited some with the Horns which is alway fun.� Yesterday, I worked some more on my sewing machine.� I am still not successful in getting it to work properly.� I hope to work on it more today.� I have many sewing projects I want to start on.� I might have to get Hubby to look at it and see what he can do. We are doing “half school” today and tomorrow.� Then on Friday, we will start our Christmas break.� Enjoy your day and God bless. 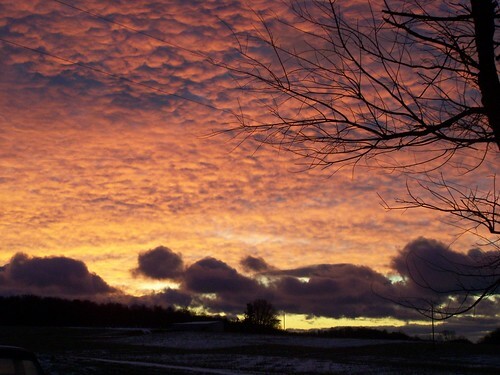 We were blessed with a beautiful sunrise this morning.� Thank you, Lord!� I just love sunrises and sunsets.� They make me feel so special. � We ended up getting some sleet and ice on top of the snow the other day.� Hopefully, it will start to melt today.�� I have some errands I want to get done tomorrow.� �We have warmed up nicely-30 degrees.� So much better than the other day.� Hubby and I walked down to the barn yesterday to get our milk.� Old Red (our truck) wouldn’t start and we thought the road was way to slick for the van.� It was a nice walk though.� I really enjoyed it.� I so much prefer walking outside to exercising inside. I think I’ll get upstairs and do some sewing.� I have a few projects I want to get done before Christmas.� Enjoy your day and God bless. 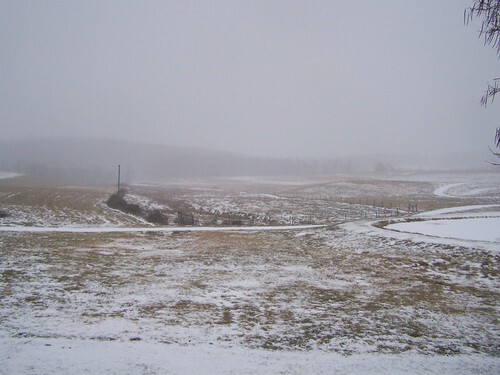 We are getting snow here this morning, hoping it stays snow and not ice or sleet.� Predictions are for 3-5 inches.� I don’t think it will accumulate that much though but we will have to wait and see.� This picture is from our bedroom window upstairs.� If you look to the right of the picture, you can see the pond with the snow that has laid on the ice.� The good news is that it has warmed up!� Temperature of� 15 this morning when we got up and hardly any wind.� YEAH! We experience some smoke problems the night before, so we let the fire go out yesterday.� Hubby checked the pipes when he came home.� All was well.� Not sure what caused it.� Maybe just the direction the wind was blowing.� This summer, we put a topper on the chimney pipe.� It is supposed to turn with the wind to keep the wind from blowing the smoke back down the chimney.� We had such a problem with that last winter.� Anyway, all looked well yesterday so hopefully it will not happen again. Well, we have things to do.� I pray your day will be full of joy.� God bless. I am making a correction to our temperature this morning.� We saw a friend of ours in Wal-mart today.� They live close to us.� He has a machine that tells him all types of weather.� It registers not just temperature but wind chill temps.� He said it was -26 degrees wind chill this morning.�� Now I know for sure that is COLD.� Just wanted you all to know.� God bless. 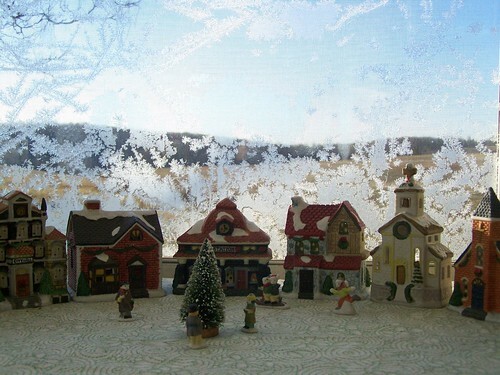 I know I’ve already posted a picture of the village but I thought it looked so good with the frost on the window behind it.� Enjoy your day, stay warm and God bless.